In beekeeping courses you’re always taught to look carefully at the underside of the queen excluder (QE) when removing it incase the queen is there. If she’s not you can then gently place it to one side and start the inspection. I inspected this colony last Sunday and my notes said something like “beautifully calm, behaving queenright but looking queenless … frame of eggs?”. The colony was on a single brood with a QE and one super, topped with a perspex crownboard. The ‘frame of eggs’ comment indicated I thought it would be wise to add a frame of eggs to the colony – if they were queenright they’d simply raise them as worker brood. However, if they were queenless they’d use them to raise queen cells. I was running out of time and anyway wanted eggs from a colony in a different apiary. If the colony were going to raise a new queen I wanted it to come from better stock. Alternatively, I’d wait and provide them with one of a recent batch of mated queens once they had laid up a good frame or two to demonstrate their quality. 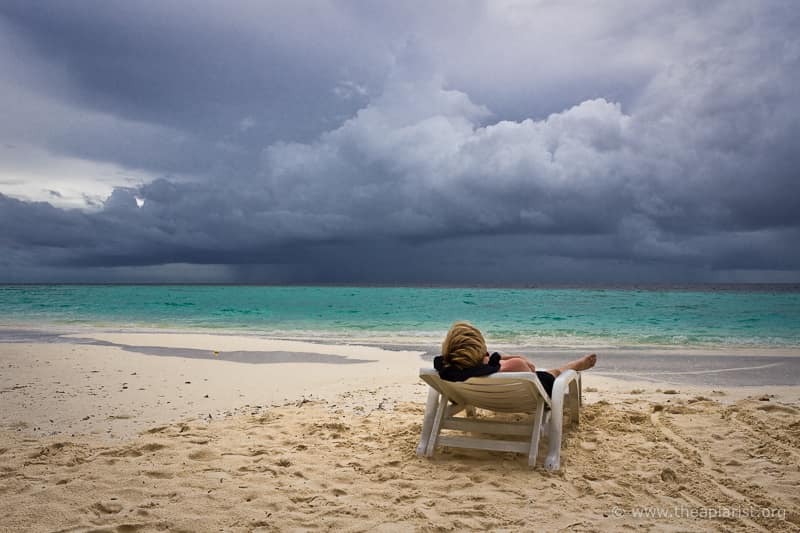 I closed them up and made a mental note to deal with the colony later in the week. I peeked through the perspex crownboard this afternoon while visiting the apiary and saw a distinctive looking bee walking about on the underside of the crownboard. Despite being upside down it was clear, even with a very brief view, that it was a small, dark queen. She was walking calmly about the super and wasn’t being hassled by the workers. I strongly suspected that she was a virgin that had either wiggled through the QE – perhaps it’s damaged or she was particularly small at emergence – and then got trapped. Alternatively, and perhaps more likely, I’d inadvertently placed a brood frame near the super during a previous inspection and she’d walked across. This colony is in the bee shed and space is a bit cramped during inspections. I know from my notes that the colony had an unsealed queen cell in it a couple of weeks ago so – weather permitting – there should still be sufficient time to get her mated before she’s too old. I removed the super, located her on the QE, gently lifted her off and placed her in the brood box. She wandered quietly down between the brood frames and the bees didn’t seem at all perturbed. 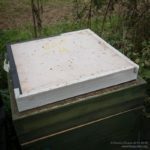 This entry was posted in Beekeeping, Photography, Queen rearing, temp and tagged lost, queen excluder, queenless, queenright, super, virgin queen on June 29, 2016 by David. 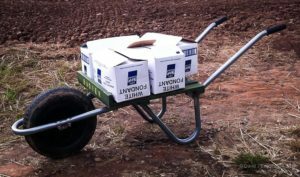 I don’t need any specialist additional equipment (such as Ashforth or Miller feeders) which need storing for 11 months a year. Fondant is simply added under the crownboard (see below). Fondant appears to attract fewer wasps and doesn’t encourage robbing by other bees, possibly because there are no spillages using it. I think fondant encourages later brood rearing as the bees take it down more slowly than syrup, so the brood nest never gets packed out with stores leaving the queen nowhere to lay. I first heard about autumn feeding with fondant from Peter Edwards of Stratford BKA 1. Most of my colonies have perspex crownboards with an inbuilt eke on one side. The 50 mm gap isn’t enough to accommodate a big block of fondant, but addition of a simple eke from 46 x 22 mm softwood provides sufficient space, and the eke (unlike the Ashforth feeders) is both inexpensive to make and has lots of other uses. Fondant (often called Bakers fondant) can be purchased from places likes BFP Wholesale who have depots around the UK and offer competitive pricing – particularly if you purchase ten or more 12.5 kg boxes at once. At the very least you are likely to need one 12.5 kg block per colony. Prepare the fondant by cutting a block in half along the long axis. Cover the cut faces with a single sheet of clingfilm (if you don’t do this they ‘fuse’ back together and are tricky to separate again), reassemble the block and put it back in the box for easy transport. Feeding with fondant is simplicity itself … having removed the supers to extract the honey I leave the queen excluder in place. I add the shallow eke and place the block of fondant with the cut face down on the queen excluder. I replace the perspex crownboard inverted, and balance the insulation block on top, before replacing the roof. You can use an empty super in place of the eke and inverted crownboard but – with luck – they’re all full of frames ready to extract if it’s been a good season. I add Apiguard at the same time, rather than feeding and treating for mites at different times. There’s little late season forage here, so not a lot to be gained from delaying feeding. The colonies take the fondant down over the next days and weeks. This happens at very different rates. Some of my colonies have already taken at least a quarter of a block (3+ kg) in about a week, with others barely touching it yet. However, by mid-late October I expect most to have emptied the blue plastic bag the fondant is supplied in. 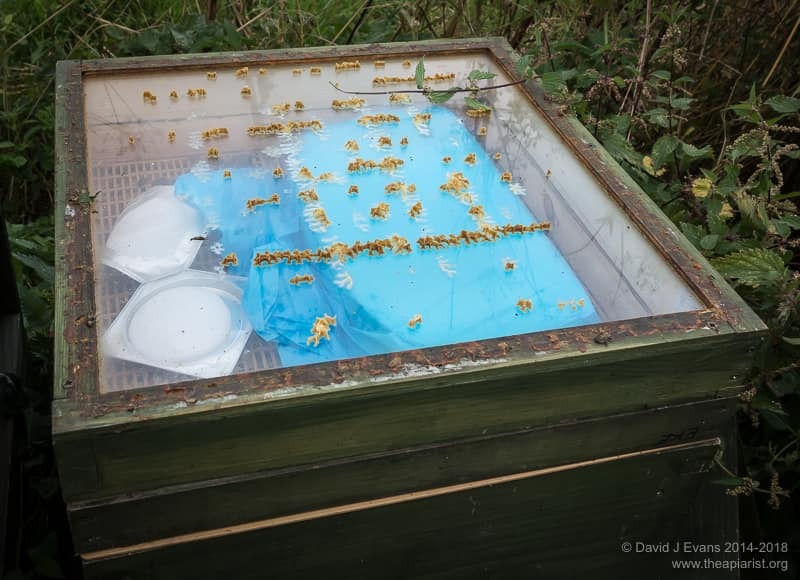 I then remove the ’empties’ and the queen excluder on a warm day and wrap the hives in DPM to prevent woodpecker damage. 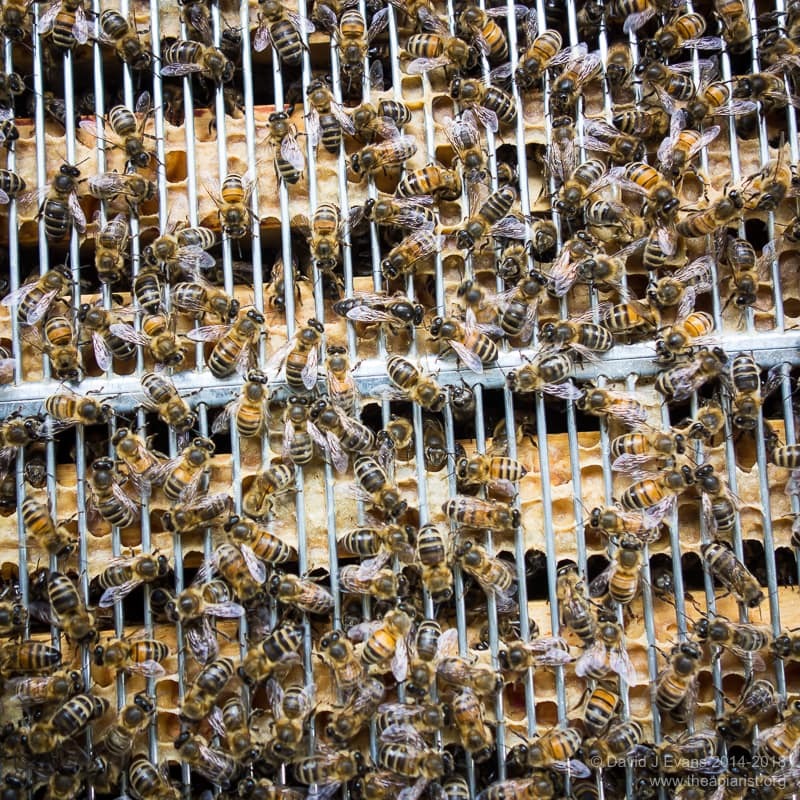 If the bees haven’t finished the fondant it can be left on overwinter, with any remaining being dissolved to make a stimulative 1:1 feed in the spring. Fondant has a long shelf life. If kept wrapped, cool and away from mice it will keep well over a year. 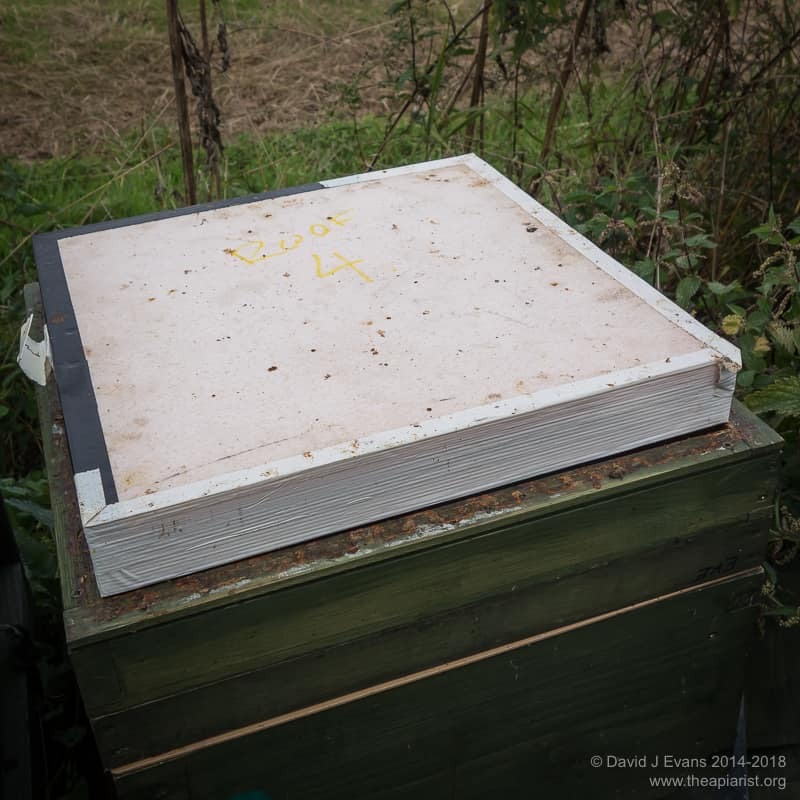 This entry was posted in Beekeeping, Feeding and tagged eke, feeding, fondant, hivebarrow, perspex crownboard, queen excluder, super, winter on August 26, 2014 by David.